What follows are three city maps. One map colors the major Asian neighborhoods by population, including Cambodian, Chinese, Filipino, Korean and Indian. Another map colors in major European ethnic groups, including the Czech/Slovak, Irish, Italians, Lithuanians, Polish, and Russians. A third map contains an income distribution chart laid over the ethnic groups. 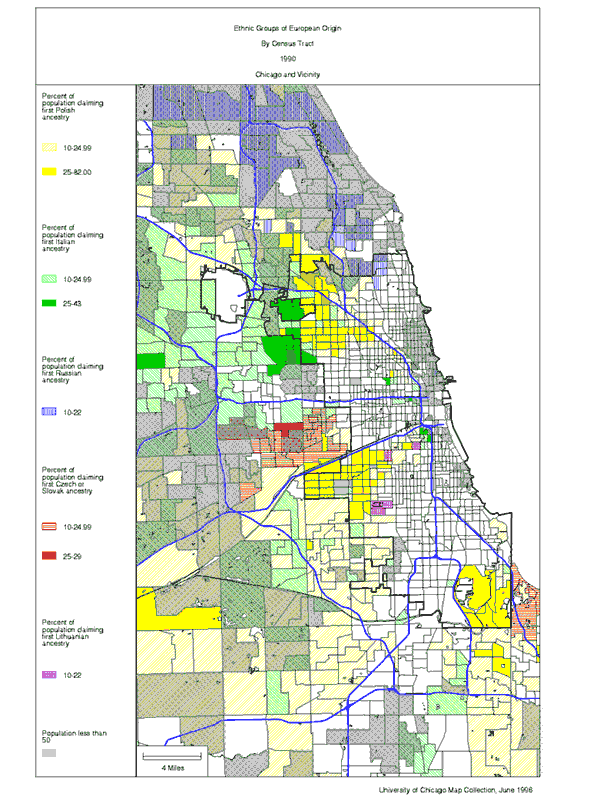 Data is based on 1990 US Government Census Bureau, and the maps come from The University of Chicago, Regenstein Library. Chicago has the largest Irish population in the world. Chicago is also home to the second largest Polish population in the world. The majority of immigrants to Chicago are from the predominently catholic countries of Ireland, Mexico, and Poland. The Archdiocese of Chicago counts 2.4 million Catholics in the counties of Cook and Lake. They calculate that Catholics make up 40% or 2-in-5 persons within the area. In Chicago, 20% of population have just arrived from their home country. This includes many who are here on visa and illegally; they are not reported on Year 2000 census figures. In many neighborhoods, one can walk down the streets and not see or hear a word of english. Chicago has a significant immigrant population. Miami and Los Angeles immigrants are mainly from Spanish speaking countries. Chicago and New York City have an equal number of european and spanish-speaking immigrants. In Chicago, the most prominent foreign languages are Polish (polski) and Spanish (espanol). These big cities are exceptional. Many cities in USA do not have large immigrant populations. For comparison, statistics for Pittsburgh and Denver are presented. Pittsburgh is home to steel factories and banking. The city is far from a port, and they do not have many immigrants. Denver is in the middle of the United States. It is far away from seaside ports. However, they are closer to Mexico, and so they have many spanish speaking immigrants. Denver also has some high-tech industry, and so there are some asian and european technology workers there. Czech includes Czechoslovakian. French includes Alsatian. French Canadian includes Acadian/Cajun. Irish includes Celtic.